She’ll Drive the Big Car. 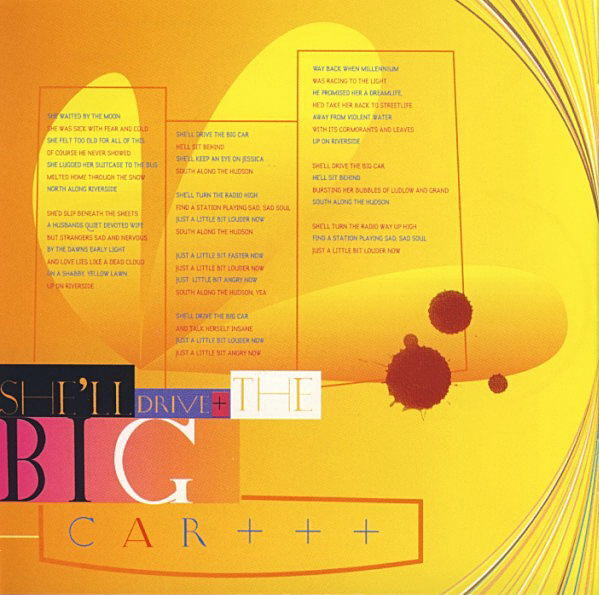 She’ll Drive the Big Car (Trafic.Musique, 2003). She’ll Drive the Big Car (live, 2003). She’ll Drive the Big Car (live, 2004). Reality is Bowie’s open revision of past missteps, having another go at sounds he’d heard in his head in 1987 or 1991 that he hadn’t quite captured on record. So some of the album’s “public” songs, the various 9/11 pieces, come off as Never Let Me Down or Tin Machine tracks as revised by a more mature, or at least more tasteful, artist. There were also a few “character” songs in which Bowie revived a lyrical conceit of “…hours.” The latter was intended (or so he said at the time) as a midlife malaise album, with songs whose perspectives were those of “friends” who’d lost their way, disappointed men facing 50 with little to show for it. Reality offered a pairing of desperate husband (demoted to a bonus track, see next entry) and enraged wife. “She’ll Drive the Big Car” concerns a former free spirit, now barnacled with husband and kids, who speeds along Riverside Drive in Manhattan, wondering if she should just cut the wheel and plunge into the Hudson River. Her trap’s reflected in the verse’s chord structure. (As opposed to his usual way of rigging a song together in the studio, “She Drives the Big Car” was “specifically a written piece,” Bowie said.) The home chord, F major, is limbo. The verse starts on the dominant chord, C major (a hope of escape: “back in millennium/meant racing to the light”), slides down to the subdominant chord, Bb major (things don’t work out: she “melt[s] home”) and ends with her circling yet again on Riverside (F). ** The refrains escape to A major until, in the last bars, the F chord returns her to stasis again. It’s “Always Crashing in the Same Car“: life as a perpetual JG Ballard car crash, every day in the same car. As with most Bowie third-person studies, there are some autobiographical asides (a cardinal Bowie rule is that no one is as interesting as him, particularly fictional people). Take the shaky falsetto in which he sings “sad, sad soul”: an uncanny throwback to the cocaine-frayed vocals on Young Americans. And the refrain of the song-within-the-song, the track blasting on the radio station as the woman drives like a demon on Riverside, is the Isley Brothers’ “Shout” (just a little bit LOUDER NOW! …a little bit softer now…), lines that Bowie had sung as a kid in his cover of “Louie Louie Go Home.” (Bowie also plays his “amateur” harmonica for the first time since the Eighties). If the depressed wife is blasting the song to distract herself (“she’s turning the radio up high so she doesn’t have to think anymore,” Bowie said), it’s also Bowie bewitching himself with an old lost voice. In the early 2000s, Bowie kept telling interviewers how happy he was in his current life. That said, this was a man who’d given up drugs, booze, cigarettes and (apparently) extramarital relationships, and whose life now revolved around child-raising (he joked that his most-heard song of ’03 was “The Wheels on the Bus”). So it’s not difficult to imagine some little part of him wishing he could chuck it all away and move back to Berlin, take up with an art collective of mad, attractive young people and drink champagne for breakfast. Unlike most of us, Bowie still could do this. If his is a life of quiet desperation, it’s of his own design. With some of the more striking images of his later years (“love lies like a dead clown***/on a shabby yellow lawn,” or the way Bowie plays with the name “Riverside Drive,” turning it into a sylvan place with “cormorants and leaves“), the lyric keeps itself open, disclosing little. Who’s the “Jessica” that the woman keeps thinking about? Her daughter, who she might kill in a car crash, or herself, staring back at her in the rear-view mirror? Who’s sitting behind—her husband or her lover? Is the big car a hearse? The track was built like a dollhouse, rooms within rooms, each piece set in place: brisk acoustic guitar work, esp. in the verses, and a snaky, twanging figure mixed left in refrains (and little feedback burst at 3:22, like a rip in the song); the synthesizer bed that sounds like a harmonium, and the yearning counter-melody in the second verse; the marimba fills; the snare drum hiccup Sterling Campbell plays to signal the refrains, and how his cymbals are mixed to sound as if he’s shaking chains (also, the perfectly-timed handclaps in the refrains). There’s even Bowie’s baritone saxophone, barely noticeable in the verses, just a dark layer in the foundation. Most impressive were the harmonies, one of the finest vocal arrangements on a Bowie track since Young Americans. It was a tapestry of Bowie, Gail Ann Dorsey and Catherine Russell, with Bowie as frantic advocate and Dorsey and Russell, with their long-held notes and their vaults up an octave, as ecstatic assurance. Tracks like “She’ll Drive the Big Car” made it seem such a shame that Bowie “retired” after Reality, as he sounded as if he still had a smoldering heap of unfinished business. In 2013, he proved he did. Recorded: (rhythm tracks, vocals) January-February 2003, (lead guitars, lead and backing vocals, overdubs) March-May 2003, Looking Glass Studios, New York. Released 16 September 2003 on Reality. ** Both C and Bb chords shift to major sevenths (“sick with fear,” “melted home”) before giving way to the succeeding chord. *** Yeah, yeah, I know the printed lyric says “cloud” but “dead clown” is such a superior image that I refuse to believe he didn’t sing it. 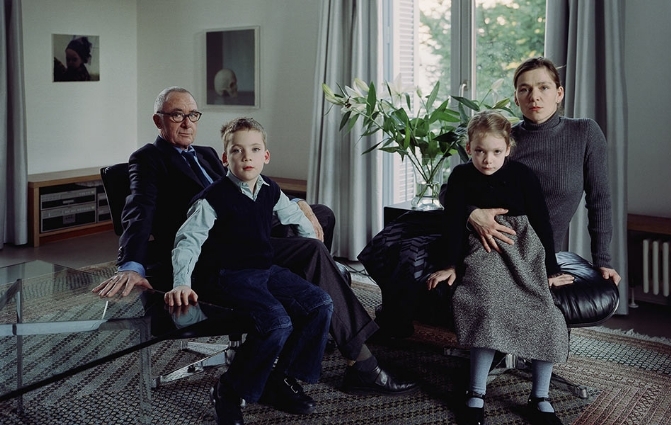 Top: Thomas Struth, “The Richter Family,” Koln, 2002. This entry was posted on Monday, January 5th, 2015 at 8:48 am and is filed under Reality: 2003. You can follow any responses to this entry through the RSS 2.0 feed. Both comments and pings are currently closed. This is a wonderful track – I think it’s easy to overlook because it doesn’t quite have the impact of some of the record’s obvious heavy-hitters, but it stands up to closer scrutiny as well (probably better) than any. That falsetto break on “sad, sad soul” is an absolute knock out. It’s my favorite song on the album. By far my favourite and I have long drawn comparisons to “Always Crashing” both in mood and sound so I like how you go there with your review. Those long drawn out harmonica buzzes and his laconic tone. I sat next to a B’netter at Wembley in ’03 and I talked to him about it before the show started – he said he looked on the song in a completely new light once he’d thought about it in that context. Imagine if Bowie could maintain this atmosphere for a whole album – that creepy, edgy tone with subtle melody, plus *real* singing. Too much of reality swerves into shouting or schmaltz. Love the low grizzled bass on this track. There are two voices in the song, the verse voice which is slightly filtered is descriptive, thoughtful and slightly detached. It’s slightly unnerving with the , whereas the chorus is more emotional and driving – as choruses go it’s pretty lengthly. Pretty spot on with the Always Crashing and Young Americans comparisons. This has always been one of my secret favorites! It’s dense without being overloaded. Some more tiny moments to call out— the way the song sort of revs up at first, like the car she’s starting. Or those two notes of feedback after the second (?) chorus. And yes, the handclaps. It’s the less bombastic songs (like, this and Fall Dog) that really make Reality for me. They end up having a bigger impact somehow (even if Fall Dog’s lyrics are obtuse, they’re delivered smaller, and come out sounding more emotional). This is one of the songs that would end up on repeat during my two hour commute days. Watching Chicago slide away through a train window, the city crumbling as the money eked out of the surrounding lives. Good soundtrack for desolation, like the best of them. I love this song too… but it also displays some of the issues I take with Reality, and even a few tracks on The Next Day. I wish the 2003 Bahamas performance was easier to locate, because it shows how the songs from Reality would all likely benefit from better pacing and more simple, but dynamic mixes. That version of Big Car starts without the drums- just jangling bells, acoustic strumming, and hand-claps… All at a slightly faster pace than the album version. The big drums don’t come in until the chorus is ready to kick in, and they serve as a warning. The guitar and Bowie’s chorus knock the door down, announcing themselves like an unwanted guest. The guitar is mixed to the front, and feels angry. Bowie’s delivery, although he flubs a line, is searing. The song builds and builds- Bowie’s vocals becoming more manic, and the harmonica really lays it on thick. The backing singers are ghostly, and yet also boiling- adding bits of punctuation, until they go full wall of sound. Compare that to the album track, where the drums just hang out for the entire running length, drudging on and on, as the guitars, along with almost everything else, lay buried. It’s not a bad song, not at all. It’s one of my favorites actually. I just wish Bowie and Visconti spent more time building a bit more drama into the presentation. This is a close second behind Looking For Water for me. The lyrics are well-paced and the narrative is delivered with wonderful detail. Not just a slick piece of music, but a showcase for Bowie’s songcraft. On that note, I will insist that the lyric in Lady Grinning Soul is “she’ll drive the bigger car,” and that this song is the sad sad sequel. I always took this song to be about a fairly well off,comfortable, but utterly bored (possibly cheated on) wife fleeing a stultifying marriage, casting a nervous eye intermittently on baby Jessica in the back seat as she goes. The thought of her considering pitching into the river never occurred to me, and if Bowie hadn’t suggested it in interviews, I would still argue that this notion doesn’t ring true. Chris, you mention that this is one of a pair of tracks about a desperate husband and estranged wife, the former being a bonus track to be addressed next. I assume that track will be “Fly”, which I have to say, is a far more engaging and affecting track than this one. Whenever I play Reality, for some reason I always find my attention drifting from this track long before it’s finished. Perhaps I have a short attention sp….ooh look, a rather interesting looking cloud. Another Reality song I’ll give a second look to based upon this blog. Also, I believe this song (or a live rehearsal take, perhaps) was used as intro music for the tour, or at least for the show I attended. I’m with Ian McDuffie on preferring tracks like this and Fall Dog to the album’s more “public” songs. It’s another grower, this one, with a beautiful, slow build and some fine singing. An elegantly understated piece, one too easily overlooked. Another great piece, with fascinating links to older songs. Another Low track Big Car reminds me of is A New Career In A New Town, with DB’s hamonica playing off its chugging rhythm. The song’s protagonist could be like the trapped DB of ’76, only one unable to escape to Berlin – like most of us, as you point out. 1. I’ve always found interesting Iman’s oft-repeated statement that she married David Jones, not David Bowie. Does it contain an implicit snub to Angie, who clings to the Bowie name decades after her divorce? Or an implicit snub to Bowiephiles like us, who might know the oeuvre better than she does, but will never get to know the real Mr Jones? 2. “I married ________ [BIRTH NAME], not ________ [STAGE NAME]” is a claim to authenticity, and therefore can’t help but be a blow against the proud artificiality and schizoid self-creation which characterised Bowie’s early years more than any other artist’s. In fact, it could be seen as a desire to un-artist the artist — and an unartisted artist is what Bowie became between 2004 and 2013. 3. What if Reality were the first solo David Jones album? And what if discarding masks, drugs, cigarettes, alcohol, adultery, artifice, make-up, superman-like self-transformation and vampiric theft were (for an artist whose whole career was based on these things) the last stage before silence? 4. Hours and Reality are the “Last Temptation of Bowie” albums: the ones in which Jones seems to ask: “What IS life like for ordinary people my age?” Jones is, so to speak, “keeping up with the Joneses”, but instead of status symbols he seems to be interested in trophies of pain: bruises, regrets, hurts, disappointments, the sense of missed opportunities and unrealised potentials. Precisely the things a Rock God, a Bowie, can never experience. 5. This song is a very good one. I like the written quality, the chords, the singing, the sense of a narrative. The fact that it mentions an intersection just two blocks from my old apartment (Orchard and Hester)! I can hear the Philly sound in it, and something Berlin-Iggy in the backing vocals, but also throwbacks to that other “Jonesy” album, Space Oddity, which had heart-on-sleeve stuff like Letter to Hermione on it, but also humanistic character-driven observational narratives like God Knows I’m Good. 6. Something about the deft “maturity” of this song makes me think of a songwriter like Paul Simon, maybe circa Slip-Slidin’ Away. There’s a sense of sadness, connecting directly to compassion. The Space Oddity album (and the Beckenham Arts Lab period, with Hutch as ersatz Garfunkel) already have Simon-shaped shadows over them. And of course Bowie has at this point recently covered a Simon song at a high-profile event marking a moment of massive generalised disappointment. 7. So perhaps we can say that the sort of solo artist David Jones would be is a “Paul-Simonish” solo artist. 8. When Burroughs asked Bowie whether he’d been influenced by TS Eliot, Bowie said he’d never read him. He’d certainly, at the very least, absorbed The Wasteland secondhand via Dylan’s Desolation Row. But something here makes me think of the extreme contrast between early Eliot (all Laforge-ism, sensuality, atmospherics, flirtation) and late Eliot (the plainness of language, the religious symbolism, the severe-yet-bland tone of an Anglican sermon). 9. One misses odd, quirky early Bowie lines like “Jung the foreman prayed at work that neither hands nor limbs would burst” just as one misses the early, quirky Bowie teeth (recently reconstructed by the young Berlin artist Jessine Hein, as it happens). But we must accept that a concern with reality has replaced the fantastic pantomimes of yore. Glamour has been expunged, ostensibly, replaced by something we might call “the glamour of ordinary despair”. 10. Finally we’re left with a paradox: “I married David Jones” is on one level a statement of fact, with all illusion and fabrication stripped away. And yet on another level the apparent artlessness is the final stage of artfulness. A David Jones — an ordinary man circling the drain — is the last, and therefore the most fantastical and contrived, thing that a David Bowie can ever be: a figure wearing make-up so subtle it looks like real wrinkles, a pantomime character so subtly fake, so alien, shape-shifting and kleptomaniac that he makes “David Bowie” look like a hopeless amateur. The only question is how interesting we find that paradox when it’s played out in front of us. Especially liked point 9. As to point 8, that’s a chink in my armour too. To correct. 6. America, on the floor. (Bowie and the nation). Up the ladder (and over the wall we go). 5. Agreed. Well. It’s a good song…the older I get the less of a “just a story” it becomes for me. But it didn’t quite end up in my best of Bowie bundle (aka Bowie songs I have in my iPhone…from Reality, those are the first three, Days and Reality…yep no Disco King. a great song but a total downer and not very suitable for on-the-go listening). Sad, sad soul though…right in the gut. Or else he’s been in ‘Murica too long. Which I now realise I misheard. I thought he was alluding to the notion some people seemed to have in the 90s of the turn of the millennium being some sort of potential source of epiphany (or something). He himself did Outside, of course. The correct words seem disappointingly prosaic. Unless I’m missing something? Perhaps it’s one of his clever bits of phrasing? It actually is “meant” though, isn’t it. That’s still what it sounds like to me. Lyric sheet be damned. ‘Sad Sad Soul’ seems to reference VU’s ‘Rock ‘n’ Roll’ ‘Sad Sad Song’ from Loaded (as I hear it anyway)…. my favourite song on ‘reality’. i always thougjht he said “meant” too. it seemed to capture the bleak disillusion of the early 00s. we all got stood up. Making my way through the roster, Chris, and almost to the final chapters. Excellent interpretation here, but I have a different read on the lyrics. I don’t think there’s a lover in the picture — Bowie sings “Of course SHE never showed,” referring to the previous line of feeling too old, meaning she never showed her family how she really felt about her disappointment and dissatisfaction. She’s alone with her suitcase, apparently planning to run away, then overcome with fear and cold, takes the bus home, north on Riverside (so she can’t actually turn left into the Hudson because she’s not driving). Then, as she crawls into bed with her husband, she fantasizes about driving a big car, with her husband (who once promised her such an exciting life, not this boring existence way up along the Hudson, say, uh, Nyack where buddy Visconti now lived?) and daughter Jessica in the car, driving south away from home, eventually passing the much hipper, cooler Soho of Ludlow & Grand (yep, Bowie’s neighborhood), blaming her husband for bursting that particular dream bubble. The song ends as she daydreams of driving faster and faster, angrier and angrier. Bowie later spelled it out – that she’s fantasizing of turning the car into the downtown buildings and ending it all – but the song leaves that to our imagination. And I’ll leave it to the shrinks to make comparisons to Bowie’s life at the time, when he’d just bought property upstate, after visiting Visconti’s Nyack home not far away, though a million light years from Soho. No, I was wrong about the lover. Bowie definitely sings “he never showed,” so the woman does return to her husband dejectedly after getting stood up. But I think I’ll stick by the rest of my interpretation. One of my all-time Bowie favs (Reality was my introduction to Bowie back in 2004, forgive me) and I always thought it was “dead clown” too, even though I never particularly liked that lyric. Sad to say, at the Trafic.Musique performance you linked, you can really hear the “d” in “cloud”. On the bright side, that same performance assures us it’s actually “meant racing to the light”. I think that the “Big Car” in question is a large SUV or the “Hummer” that was the largest of them all, that David’s NYC must have been crawling with when this song was penned. Sorry, I had to open with something meaty. I actually just woke up today with this “realization,” since it’s the end of 2016, the year of the demon, and all of media is in blackout, and I’d been listening to Heathen, and doing the Bowie+Internet=Vision Quest thing; until Heathen was all used up, and so I moved onto Reality. The key to this song (like increasingly seems to be the key for them all) is the illustration of a Jung/Freud dynamic; in this case Thanatos: the death drive. But also this song is commentary on the current climate, like so many of these songs on these albums are–and indeed perhaps all of David’s songs, as it’s easy to miss allusions to current events if you’re never there. But in the United States a very weird thing happened–as often does–where the conservative elements retaliated by buying the largest cars they possible could, with the worst fuel economy. This because an aspirational trend, where the working classes also bought these vehicles, since cars are essential here, often bankrupting themselves, and the rich retaliated by buying these damned things for their 16yo children, so that you have the absurd image on a daily basis over here of children driving what are functionally military-grade tanks. I think David could not resist to comment on this, but linking a death drive to this phenomenon is almost pedestrian, anyone bewildered by the sight of these things has probably had the thought themselves. So he added to his vignette all of these things to turn it from on the nose, to a thumbing of the nose. He gave us the key to the car when he says the wife/mother is contemplating killing herself–probably with here daughter in the car, which draws a parallel to parents over here sacrificing their children to these dark urges, condemning them to future where life cannot live on the planet they will inherit. Today there are even people who customize their cars with smokestacks. It’s not merely a status symbol. The big car. Bowie’s music has always been saturated in a heavy melancholy, regardless of his love for life and living. As we eventually discover in the Next Day, ‘Where Are We Now’ to be specific, Bowie is no less a victim of nostalgia than anyone else by directly reminiscing on his time in Berlin, sort of. This is a classic track which brings you closer to the side of Bowie which we can can all relate to as individuals. The harmonica solo is a direct instrumental reference or development from Low’s, ‘A New Career In A New Town’. In atmosphere and theme, this track quite certainly has came from the same place as ‘Always Crashing In The Same Car’ for sure. Whats interesting is this vibe appears again in Blackstar’s final track, ‘I Can’t Give Everything Away’. The style of backing vocals here are also littered throughout Blackstar, they are angelic, which can be just as frightening as they are comforting, appropriate to the themes in this song and more generally Bowie as an artist. But hey, we all know Bowie created a catalog of musical moments which he would pick and chose as he saw appropriate and put them together in an infinite number of patterns. Getting back to the nostalgia I kinda feel like Bowie always had some sort of longing to return to the intensity of life and work he experienced in the Berlin years, the music then was all him, fresh and new. Place of course has nothing to do with it but more time – the ‘Berlin era’, the things he could do then, the person he could be and outcomes he could achieve. Later with the distractions and commitments of love, life, the restraints of eternal fame, along with declining health, he had no choice other than to just do less – and that is a hard thing to come to terms with. We all know this is why he moved to a new town, NY, he could record, go out, experience, be with family all within a small local area. Despite these struggles we find that Bowie in his final years managed to work out a way of saying and doing so much more, with a hell of a lot less. Kind of like a Picasso sketch. And whilst doing so giving a little bit more of himself away (but of course not everything). Something he admitted in later years he started to do a lot more of, and by the end, I think he got a great kick out of, doing so in such obscure manner that it will leave us all guessing for a very long time. So sure. He’s telling us a little bit about himself by embodying the stay at home wife (whether she has the big car (and is dissatisfied with how hollow it is) or dreams of it), we all experience the same feeling of disillusion with our current state, reflect on the what if’s at many points in our lives. PS. How nobody has commented on hearing the Staple Singers ‘I’ll Take You There’ in the backing vocals. Even though no reference is made in the published lyrics it is clearly audible. Must have been a huge influence even before Young American’s time, great track, totally hedonistic, kind thing you would hear on a ‘station playing sad, sad soul’. Oh, and not to forget, it has an eerily similar harmonica instrumental.